I've been talking about making myself a bolero for so long now, that I'm pretty sure they're officially 'out' now. No worries though, because one of the fabulous benefits of being a parent is that I can live out my own fantasies through my children (I'm so kidding. really. ), for whom these trends last a bit longer. 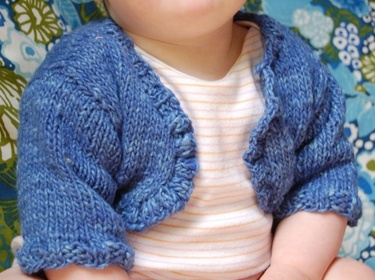 Hence my huge excitement when I found the Baby Bolero in One Skein. Fabulous. The pattern is sized for a newborn, so I did a tiny bit of adjusting (I don't remember what I did, if you're wondering. sorry!) in hopes that it would fit my no-longer-a-newborn baby (sniff, sniff). I used some Noro something-or-other from my stash, in Indigo Blue, I think. As you can see, I could have done a bit more adjusting, as it's a bit wee. So I think this might be heading to an even tinier friend. Although maybe it's a perfect 'summer length'. Hmnn. I adore the pattern detail on the back (as much as I adore that big brother foot that I couldn't bring myself to crop out of this photo). I really like this pattern, and like the others in that book that I've checked out, it was super easy to follow, and fairly quick (great for getting me back in the knitting game after the wrist problem that we're still not talking about). This would be such a fun baby gift to make. 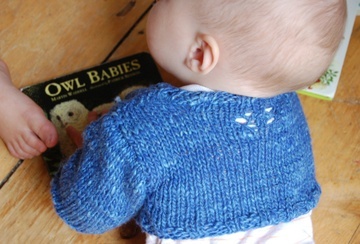 By the way, have you seen the One Skein Knitalong Blog? 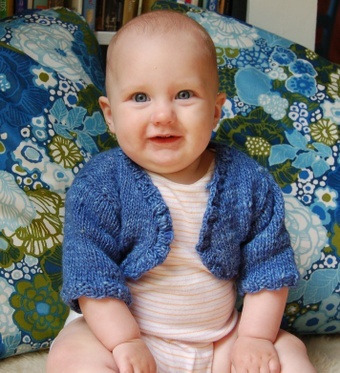 Now, a very big Thank You for humoring my twice-in-one-week 'look at my adorable baby in clothes that I made her' post.